View attached file 'FF-urlhider.html' and simply click the innocent looking anchor tag. We end up in a completely empty URL address yet we control its documents content. The problem here is that we are able to hide the URL from the user and make it seem like they visited a trusted website. Since we control the content displayed then this kind of bug could easily be used to perform social engineering/phishing attacks. If the address bar is set to an absolute empty 'about:blank' (which displays nothing in the address bar except 'search or enter address' then its contents should reflect that and be empty, otherwise its a security risk. I'm not sure if this is something going wrong with the displaying of the URL bar in the front end, or if it could be some kind of document navigation issue. mwobensmith said he confirmed this issue. > issue. mwobensmith said he confirmed this issue. 2)  A timer is started to do location.reload(). But you can achieve the same effect by simply taking out that call from the testcase and clicking the reload button yourself, for convenience. 12001       // We're loading a URL that will execute script from inside asyncOpen. 12004       // code in the URL. Note that even without the reload() call we have a tab with the Google url and favicon. Note further that even without all this stuff a page could window.open("about:blank", "_self") and then inject content into there, right? We _could_ try to do something in nsJSProtocolHandler wherein if we don't plan to load any data and the current content viewer on the docshell is not showing and was created by CreateAboutBlankContentViewer we would just go ahead and Show() it. 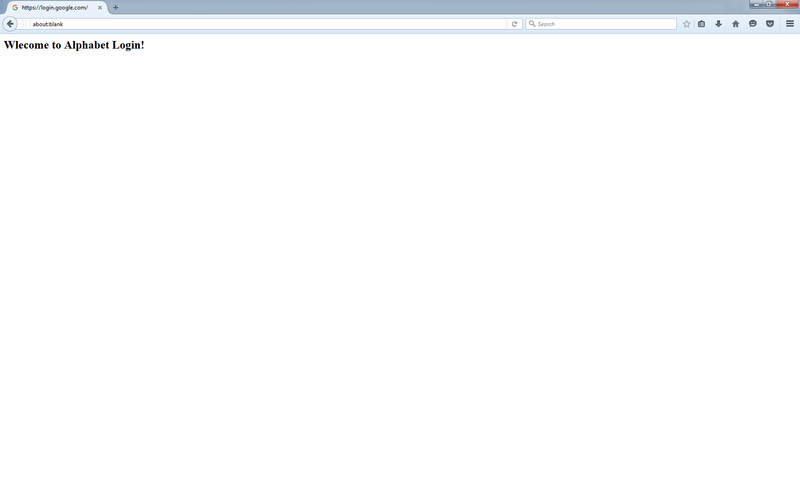 In this testcase that means that an actual blank page would be showing in the browser window. We could even put this Show() call on a runnable that docshell posts after doing the InternalLoad(), assuming that content viewer is still current at that point (which would imply that the script didn't return a string). That would be good for maintaining our internal invariants in some sane way, but wouldn't address the spoofing issue, imo. > Note further that even without all this stuff a page could window.open("about:blank", "_self") and then inject content into there, right? OK.  Gijs, why is the UI not managing that in this case? Interestingly, testing this on FF nightly 45.0a1 the document completely freezes (with the 'red' clicked anchor tag frozen) right clicking does not work. > OK.  Gijs, why is the UI not managing that in this case? I don't know offhand, but I can look into it. IOW, if there's a content opener, we will not replace about:blank, but we will in all other cases. I think this is because this used to be the new tab page, and so if you opened the new tab page you wouldn't want there to be anything in there. We kept this for about:blank because some people overrode the default new tab page with about:blank because they didn't like it and/or it was slower, so it stayed in the list. It seems like rather than just for openers, we would also want to do this if a page changed its own window to be about:blank. I think that would require exposing that on docshell somehow, unless there's already some way to determine that that I'm not aware of... Perhaps the progress listeners could figure this out and set a flag? We can achieve an actual full URL spoof (without the need to put invalid characters) by simply changing the latest testcase that uses 'https://facebook.com`' with 'http:https://facebook.com', this will result in the URL address displaying 'https://facebook.com' with its document controlled by us. Would this be considered a high risk bug given the new information? I'm not sure. Maybe Dan can answer that. Simply modify the test case in comment #17 where instead of navigating to 'https://www.facebook.com`' we have it go to 'https://qabandi.com/' (this site does not use trusted certs) which will give us the desired error page. Follow the same steps and the URL bar will end up displaying 'https://qabandi.com/' with the document controlled by us. I'll clear the rating so it gets looked at again at our next security triage meeting. Is it possible to get an update on this? Sorry, with the end of the year we haven't had a chance to look at this in the triage meeting yet. Here is a small bug that I believe is due to the faulty behavior described here. Gijs, can you look at this some more? This has been sitting around for a few months. Thanks! Yes, I assumed it was waiting for a new sec rating and verification of the new suggestion in comment #22. FWIW, the end-result and requirements (user presses back button) seem fairly similar to bug 1245264 (which might help in terms of the sec rating), but the cause is different. Ni for updated sec rating. Anyway, in terms of looking at this, it seems comment #22 changes the mechanics on our side enough that I'm not entirely sure if the same issue I identified in comment #13 is still causing what's going on there, though it doesn't help that it's 10pm and Nightly keeps crashing when I try to use the browser debugger. Really, Marco might be a better person to investigate this. Marco might also know the answer to the question at the tail end of comment #13 about how we determine whether about:blank is a user load or not (even if that does turn out to not be relevant for the change in STR from comment #22). Yes, we could trivially remove about:blank from that set of pages, but it seems likely that new-tab-url-replacement add-ons will just add it back, and that wouldn't actually fix the security issue with that. Would like to point out that according to ( https://wiki.mozilla.org/Security_Severity_Ratings .) 'sec-high' is the recommended rating for a "Spoofing of full URL bar or bypass of SSL integrity checks." I just made some more time to look at this. When I use the testcase and steps from comment #22, the <browser>'s currentURI is wrong. It should be pointing to about:blank, or, failing that, the URI that originally opened about:blank, and instead I get the URI from which we went back (so https://qabandi.com/). The browser's documentURI is correct (about:blank), as is the document element's nodePrincipal. Boris, that seems like a docshell issue. Am I missing something? Sounds like it, but it also sounds like something different from the original issue reported in this bug (the one I analyzed in comment 6). Seems like we should get a new bug filed on the interaction involving session history, and probably ask Olli whether he can take a look. > original issue reported in this bug (the one I analyzed in comment 6). > session history, and probably ask Olli whether he can take a look. This forces about:blank to be shown in these cases, AFAICT. This depends on us actually using wyciwyg to identify cases where we construct these documents based on something other than just the user requesting that URI. I'd like to know if that is a sane assumption. I don't understand what that patch is trying to do and what problem it's actually solving and why... I assume in this case aURI is falsy? What is gBrowser.currentURI? Is it wycywig:about:blank or some such? Why can we not just set canOmitURI to false if uri.spec != originalURI.spec ? All that said, how is this all different from clicking a link opening a popup that then navigates the _parent_ to about:blank? In that situation, what will show up in the URL bar with the patch? Without the patch? Address comment #8 - force about:blank to show up instead of an empty address bar. This was the original problem reported in this bug. > actually solving and why... I assume in this case aURI is falsy? but it doesn't matter much if it's that or gBrowser.currentURI that's producing the wyciwyg URL here. > gBrowser.currentURI? Is it wycywig:about:blank or some such? More or less, IIRC wyciwyg:/0/about:blank or whatever. But I can't seem to reproduce this again, though it could be because my build state is a bit messed up at the minute. I'm traveling this weekend and I don't think I'll be able to dive into detail on this before late on Sunday, or Monday. > Why can we not just set canOmitURI to false if uri.spec != originalURI.spec ? We could, I think. Are there other cases that that would catch? > what will show up in the URL bar with the patch? Without the patch? Right, after having a few days to ponder this one, this seems like a more correct fix. It fixes both the original testcase and the case described by Boris in comment 37 (pre-patch: empty location bar; post-patch: 'about:blank'). Boris/Marco, does this look safe/sensible to you? Ah, this is much clearer. At least it directly compares the two things we care about: the URI we're going to show and the URI of the origin involved, if any. How hard would be to write a test for this? Based on the change sounds like something that could be easily reverted inadvertently. Does the test for bug 1247968 cover this one as well? this needs a nice javadoc explaining why it exists and when it is supposed to be used. We should not really expect devs hitting it having to do code archeology and go through all of this bug. I'd also suggest to rename it to something more meaningful, for example something like checkEmptyPageIdentity or such, otherwise the code where it appears becomes a little bit more obscure. Please add a comment before each heuristic explaining why it's a good way to distinguish valid empty pages from invalid ones. Again, we don't want people to guess or go through the whole discussion. Sorry, this last heuristic is a little bit unclear to me, which are the cases hitting it? > something that could be easily reverted inadvertently. I'll have a look. I wouldn't expect it to be particularly difficult necessarily. > Does the test for bug 1247968 cover this one as well? There is no test there, but the cause of the issue there is different, AFAICT, so I'd expect the fix and test to be different, too. > archeology and go through all of this bug. > appears becomes a little bit more obscure. We're not really checking 'identity', though, are we? We're essentially checking "does the web control the contents of this page", except that if people use an add-on to explicitly set the new tab page to a web URI, we're clearing the location bar for that, too. I think that's a bad idea, but it means that naming the method "isPageControlledByWeb" doesn't really work. Maybe "pageURIMatchesPrincipal". There are a number of different principal implementations. Some of them have URIs (normal web pages, and null principals have a moz-null-principal URI). However, not all of them do - and in particular, the system principal has no URI, and expanded principals do not have a single URI either (their .URI property is null). The code implies that we only think the page is empty / the URI matches the principal if the principal is the system principal. AIUI web code shouldn't normally be able to cause a page to be created that has an expanded principals. Add-ons might be able to; I'm not sure. Either way, restricting the case where we think a tab is empty/not-web-controllable, when it has no URI, to cases where it has the system principal seemed safest. > We're not really checking 'identity', though, are we? I know identity is not a perfect word, but at least it clarifies the kind of check. We are checking if the empty page is really what it asserts to be, like an identity check. if not that we're also checking other stuff, like contentOpener, and system principal doesn't really match anything. I was thinking of something a little bit more generic. > when it has no URI, to cases where it has the system principal seemed safest. In case it's not obvious: loading the 'broken' JS URI causes an exception here that the test framework complains about otherwise. > +    // contentPrincipal in the e10s case. So we can assume this is safe cause browser never got the contentPrincipal from the child, thus it's unlikely the child tried to forge it? "Need to specialcase this because, in the e10s case, tabbrowser caches the contentPrincipal when it gets it from the child process LocationChange listener. If it never heard anything about this browser, it won't have a contentPrincipal for it yet. In such a case it's unlikely the child may have forged a fake empty location." yeah, please add a comment above the expectUncaughtException, it's clear only to whoever wrote the test. Moreover the "broken" js is not visible in the test file since it's in another file. > > +    // contentPrincipal in the e10s case. > from the child, thus it's unlikely the child tried to forge it? > forged a fake empty location." I was not happy with this, so I kept digging. Basically, it turns out this is bug 1249362. I'll make the check specific to e10s as well, reference that bug, and the e10s team can hopefully fix that separately. Many thanks to mconley for helping me sort this one out. I actually thought it was on purpose exactly because the parent process was waiting for the principal from the content process... Good that we can fix it. -  // system principal (this matches e.g. on about:blank). +  // system principal (this matches e.g. on about:home). Ugh, and that comment should quote about:newtab, not about:home. I can fix that in a DONTBUILD push, I guess, assuming that this fix is correct. That seems fine, yes, since a nullprincipal about:blank is clearly one that a web page did not open (and can't control). Does the fix work for the little bug mentioned in Comment 28 also? > Does the fix work for the little bug mentioned in Comment 28 also? I'll file a separate bug about this. I'll try to put up a patch for uplift tomorrow. [Risks and why]: low-ish, as it is a fairly focused change, it has tests, and the URL bar has reasonable test coverage in general, but obviously it's starting to get late-ish in this cycle. Attachment #8723072 - Flags: approval-mozilla-beta? [Risks and why]: low, as it is a fairly focused change, it has tests, and the URL bar has reasonable test coverage in general. Attachment #8723075 - Flags: approval-mozilla-aurora? Looks good to me? The problem was that the URL bar would display nothing. Now it explicitly says about:blank. AIUI that's the desired behaviour here. > Now it explicitly says about:blank. AIUI that's the desired behaviour here. Ok, but the content is still loaded. Moreover, the tab circle spins forever. And the Inspector is frozen. > > Now it explicitly says about:blank. AIUI that's the desired behaviour here. > Ok, but the content is still loaded. or whatever. Not much we can do about that without breaking the internet. > Moreover, the tab circle spins forever. It doesn't in your screenshot. > And the Inspector is frozen. Also no inspector in your screenshot. Both of these also happened before this fix, no, or are they regressions? Both of these seem like issues that could be worth followups if you can distill down why/when they happen from the original testcase. > Not much we can do about that without breaking the internet. FWIW, Google Chrome doesn't load the content. > Both of these also happened before this fix, no, or are they regressions? Yes, both happened before the fix too. > > Not much we can do about that without breaking the internet. > FWIW, Google Chrome doesn't load the content. > > Both of these also happened before this fix, no, or are they regressions? > Yes, both happened before the fix too. OK, please CC me on any followup bugs you file. I believe that was filed as a separate issue and it's not fixed yet. being a trivial testcase (on both Chrome and IE on Windows, the location bar there shows about:blank, as it does for us). I don't know if this stuff is specced at all, but it seems worth converging on with other browsers if a change does need to be made. Probably worth taking up with the relevant w3c/whatwg working groups. It is. What we do now follows the current spec. Well, I mean the URL bar is not specced, so I guess we can do whatever we want there. But observable things about the document and window like location.href and document.URL are. > location.href and document.URL are. As I noted earlier, it seems all the browsers behave the same right now, but I don't really see a good reason not to change that (beyond engineer-me-being-irked :-) ).